I visited Imback Canyon Conservation Area, Maliau Basin Conservation Area and Sepilok Conservation Area in this time. In Imback Canyon, I had some trekking and watched some animals (e.g. three species of civets, gibbons, etc.). I also attended tree planting ceremony in future planed camp site. 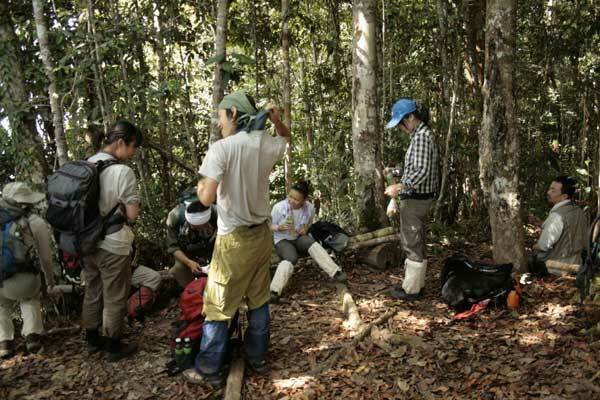 In Maliau Basin, I stayed a few days inside the basin, and trekked. Through trekking, I watched many kind of environment, for example, Heath forest, poor soiled rainforest where many pitcher plants exist, some great water falls, and rivers which water is black. Near the study centre in Maliau, I watched many animals (e.g. gibbons, beard pig and hornbill). And I watched three species of civets, giant flying squirrel, owls and sambar in night drive and night walk. Through staying in Imback Canyon and Maliau Basin, I watched many different environment, vegetation, plants and animals. In Sepilok, I had some meetings to discuss about my future research in Sabah. And I also watched Orangutang, pig tail maqaque, flying lemur, chevrotain and king fisher there.